A New Jersey woman was arrested after police said she brought her 5-year-old daughter into a tanning booth, causing the girl to suffer burns. But the mom says her daughter was never exposed to tanning booth lights and was only slightly burned by sunlight while playing outdoors. Ida Siegal reports. The owner of City Tropics Tanning in Nutley, N.J., where Krentcil allegedly brought her daughter, said his employees told him that the day the little girl came to the salon, she waited with her dad and little brother outside while Krentcil spent about 12 minutes in the booth. The girl then told classmates at school that she "went tanning with Mommy," her father told NBC 4 New York. 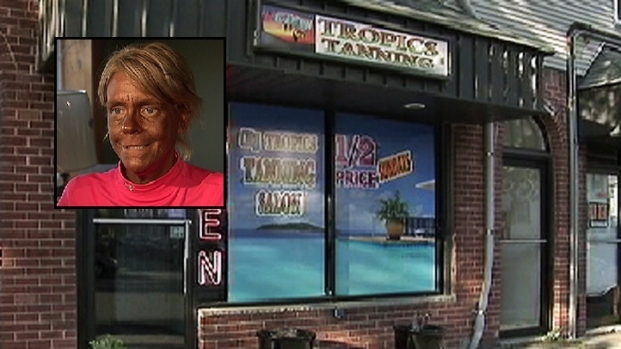 He thinks a teacher overheard, inaccurately connected the girl's sunburn to the tanning salon trip and contacted police. PREVIEW: The New Jersey mom who was arrested on a child endangerment charge for allegedly taking her daughter into a tanning salon room says the girl was never exposed to UV rays from the booth. Watch her full interview with NBC 4 New York Tuesday night at 11:00 p.m.